A simple press of the F7 function key toggels the execution screen on and off and the F9 function key toggels the Ticker on and off. This powerful combination of tools gives you a tremendous advantage over on-line brower based level 1 order entry systems. Notice the range bar located just below the high and low prices. It moves from side to side, showing the depth of the level 2 market. In the lower right hand corner you will see order options that make order entry super easy. Click a check mark into the "Bid/Offer" box and all buys and all sells are automatically entered at the best bid or offer. The stock price is going down? Sell short by clicking the "Short" box and then the sell button. You own the stock and the price is dropping fast? Click in the "Pref." box and sell your stock below the bid to dump it in a hurry. We show you how! Conditional orders! Now we're talking! Use conditional orders to set stops and sell points. Don't worry, we show you how to use them. Our training course will teach you all about the market maker windows, the order entry execution screen, and the ticker. 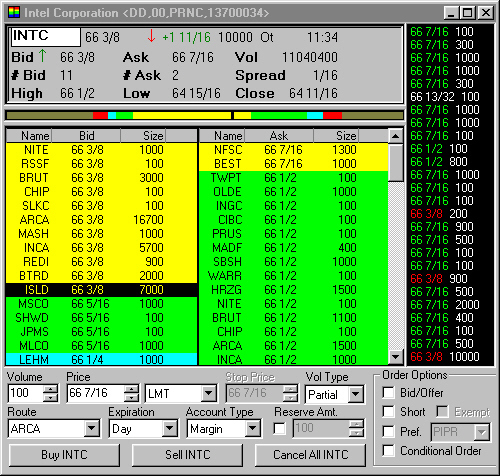 Learn how to use conditional orders to set trailing stops as well as Stop loss orders.